Jews sans frontieres: Wiping Israel off the map? Wiping Israel off the map? I just read on the Jewish Chronicle website that Harper Collins left Israel off of the map in an atlas it sells in the Middle East. The American-based publishing giant said it regretted leaving the country out of atlases it sells to English-speaking schools in the Middle East. 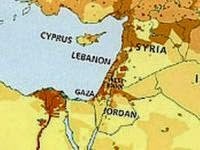 In a statement reported in the Israeli media, it said: “HarperCollins regrets the omission of the name Israel from their Collins Middle East Atlas. This product has now been removed from sale in all territories and all remaining stock will be pulped. HarperCollins sincerely apologises for this omission and for any offence caused”. Well well, the West Bank and Gaza but no Israel. And no Palestine either. Earlier in the week Collins Bartholomew, a subsidiary of HarperCollins, told the Catholic newspaper, The Tablet, that including Israel in its “Collins Primary Geography Atlas For The Middle East” would have been “unacceptable” to customers in the Gulf states. Leaving Israel off the maps incorporated “local preferences,” it said. But if the omission of Israel was to incorporate "local preferences" why no Palestine? And if they do include Israel where will the boundaries go? I tend to the view that Israel's existence is only temporary anyway. Maybe Harper Collins should simply wait until Israel disappears and then publish its atlas in the Middle East. CH wasn't racist? Does anyone still say so? What kind of low-life politicises suffering?